This article is about the perceptual phenomenon. For the piano practice tool, see Synthesia. How someone with synesthesia might perceive certain letters and numbers. Synesthetes see characters just as others do (in whichever color actually displayed) but may simultaneously perceive colors as associated with or evoked by each one. The term is from the Ancient Greek σύν syn, "together", and αἴσθησις aisthēsis, "sensation". The earliest recorded case of synesthesia is attributed to the Oxford University academic and philosopher John Locke, who, in 1690, made a report about a blind man who said he experienced the color scarlet when he heard the sound of a trumpet. However, there is disagreement as to whether Locke described an actual instance of synesthesia or was using a metaphor. The first medical account came from German physician, Georg Tobias Ludwig Sachs in 1812. In one common form of synesthesia, known as grapheme-color synesthesia or color-graphemic synesthesia, letters or numbers are perceived as inherently colored. In spatial-sequence, or number form synesthesia, numbers, months of the year, or days of the week elicit precise locations in space (for example, 1980 may be "farther away" than 1990), or may appear as a three-dimensional map (clockwise or counterclockwise). Synesthetic associations can occur in any combination and any number of senses or cognitive pathways. Only a few types of synesthesia have been scientifically evaluated. Awareness of synesthetic perceptions varies from person to person. Difficulties have been recognized in adequately defining synesthesia. Many different phenomena have been included in the term synesthesia ("union of the senses"), and in many cases the terminology seems to be inaccurate. A more accurate but significantly less common term may be ideasthesia. Some synesthetes often report that they were unaware their experiences were unusual until they realized other people did not have them, while others report feeling as if they had been keeping a secret their entire lives. The automatic and ineffable nature of a synesthetic experience means that the pairing may not seem out of the ordinary. This involuntary and consistent nature helps define synesthesia as a real experience. Most synesthetes report that their experiences are pleasant or neutral, although, in rare cases, synesthetes report that their experiences can lead to a degree of sensory overload. Though often stereotyped in the popular media as a medical condition or neurological aberration, many synesthetes themselves do not perceive their synesthetic experiences as a handicap. To the contrary, some report it as a gift—an additional "hidden" sense—something they would not want to miss. Most synesthetes become aware of their distinctive mode of perception in their childhood. Some have learned how to apply their ability in daily life and work. Synesthetes have used their abilities in memorization of names and telephone numbers, mental arithmetic, and more complex creative activities like producing visual art, music, and theater. Despite the commonalities which permit definition of the broad phenomenon of synesthesia, individual experiences vary in numerous ways. This variability was first noticed early in synesthesia research. Some synesthetes report that vowels are more strongly colored, while for others consonants are more strongly colored. Self reports, interviews, and autobiographical notes by synesthetes demonstrate a great degree of variety in types of synesthesia, intensity of synesthetic perceptions, awareness of the perceptual discrepancies between synesthetes and non-synesthetes, and the ways synesthesia is used in work, creative processes, and daily life. Synesthetes are very likely to participate in creative activities. It has been suggested that individual development of perceptual and cognitive skills, in addition to one's cultural environment, produces the variety in awareness and practical use of synesthetic phenomena. Synesthesia may also give a memory advantage. In one study conducted by Julia Simner of the University of Edinburgh it was found that spatial sequence synesthetes have a built-in and automatic mnemonic reference. So the non-synesthete will need to create a mnemonic device to remember a sequence (like dates in a diary), but the synesthete can simply reference their spatial visualizations. projective synesthesia: people who see actual colors, forms, or shapes when stimulated (the widely understood version of synesthesia). associative synesthesia: people who feel a very strong and involuntary connection between the stimulus and the sense that it triggers. For example, in chromesthesia (sound to color), a projector may hear a trumpet, and see an orange triangle in space, while an associator might hear a trumpet, and think very strongly that it sounds "orange". Synesthesia can occur between nearly any two senses or perceptual modes, and at least one synesthete, Solomon Shereshevsky, experienced synesthesia that linked all five senses. [medical citation needed] Types of synesthesia are indicated by using the notation x → y, where x is the "inducer" or trigger experience, and y is the "concurrent" or additional experience. For example, perceiving letters and numbers (collectively called graphemes) as colored would be indicated as grapheme → color synesthesia. Similarly, when synesthetes see colors and movement as a result of hearing musical tones, it would be indicated as tone → (color, movement) synesthesia. From the 2009 non-fiction book Wednesday Is Indigo Blue. Note this example's upside-down clock face. In one of the most common forms of synesthesia, individual letters of the alphabet and numbers (collectively referred to as graphemes) are "shaded" or "tinged" with a color. While different individuals usually do not report the same colors for all letters and numbers, studies with large numbers of synesthetes find some commonalities across letters (e.g. A is likely to be red). Another common form of synesthesia is the association of sounds with colors. For some, everyday sounds such as doors opening, cars honking, or people talking can trigger seeing colors. For others, colors are triggered when musical notes or keys are being played. People with synesthesia related to music may also have perfect pitch because their ability to see/hear colors aids them in identifying notes or keys. The colors triggered by certain sounds, and any other synesthetic visual experiences, are referred to as photisms. According to Richard Cytowic, chromesthesia is "something like fireworks": voice, music, and assorted environmental sounds such as clattering dishes or dog barks trigger color and firework shapes that arise, move around, and then fade when the sound ends. Sound often changes the perceived hue, brightness, scintillation, and directional movement. Some individuals see music on a "screen" in front of their faces. For Deni Simon, music produces waving lines "like oscilloscope configurations – lines moving in color, often metallic with height, width and, most importantly, depth. My favorite music has lines that extend horizontally beyond the 'screen' area." Individuals rarely agree on what color a given sound is. B flat might be orange for one person and blue for another. Composers Franz Liszt and Nikolai Rimsky-Korsakov famously disagreed on the colors of music keys. A number form from one of Francis Galton's subjects (1881). Note how the first 12 digits correspond to a clock face. 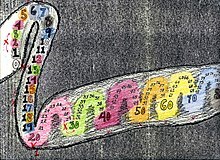 A number form is a mental map of numbers that automatically and involuntarily appears whenever someone who experiences number-forms synesthesia thinks of numbers. Number forms were first documented and named in 1881 by Francis Galton in "The Visions of Sane Persons". In auditory-tactile synesthesia, certain sounds can induce sensations in parts of the body. For example, someone with auditory-tactile synesthesia may experience that hearing a specific word feels like touch in one specific part of the body or may experience that certain sounds can create a sensation in the skin without being touched. It is one of the least common forms of synesthesia. Ordinal-linguistic personification (OLP, or personification for short) is a form of synesthesia in which ordered sequences, such as ordinal numbers, week-day names, months and alphabetical letters are associated with personalities or genders (Simner & Hubbard 2006). For example, the number 2 might be a young boy with a short temper, or the letter G might be a busy mother with a kind face. Although this form of synesthesia was documented as early as the 1890s (Flournoy 1893; Calkins 1893) researchers have, until recently, paid little attention to this form (see History of synesthesia research). This form of synesthesia was named as OLP in the contemporary literature by Julia Simner and colleagues  although it is now also widely recognised by the term "sequence-personality" synesthesia. Ordinal linguistic personification normally co-occurs with other forms of synesthesia such as grapheme-color synesthesia. Misophonia is a neurological disorder in which negative experiences (anger, fright, hatred, disgust) are triggered by specific sounds. Richard Cytowic suggests that misophonia is related to, or perhaps a variety of, synesthesia. Miren Edelstein and her colleagues have compared misophonia to synesthesia in terms of connectivity between different brain regions as well as specific symptoms. They formed the hypothesis that "a pathological distortion of connections between the auditory cortex and limbic structures could cause a form of sound-emotion synesthesia." This is a rare form of synesthesia where individuals feel the same sensation that another person feels (such as touch). For instance, when such a synesthete observes someone being tapped on their shoulder, the synesthete involuntarily feels a tap on their own shoulder as well. People with this type of synesthesia have been shown to have higher empathy levels compared to the general population. This may be related to the so-called mirror neurons present in the motor areas of the brain, which have also been linked to empathy. This is another rare form of synesthesia where certain tastes are experienced when hearing words. For example, the word basketball might taste like waffles. The documentary 'Derek Tastes Of Earwax' gets its name from this phenomenon, in references to pub owner James Wannerton who experiences this particular sensation whenever he hears the name spoken. It is estimated that 0.2% of the population has this form of synesthesia. Other forms of synesthesia have been reported, but little has been done to analyze them scientifically. There are at least 80 different types of synesthesia. In August 2017 a research article in the journal Social Neuroscience reviewed studies with fMRI to determine if persons who experience Autonomous Sensory Meridian Response are experiencing a form of synesthesia. While a determination has not yet been made, there is anecdotal evidence that this may be the case, based on significant and consistent differences from the control group, in terms of functional connectivity within neural pathways. It is unclear whether this will lead to ASMR being included as a form of existing synesthesia, or if a new type will be considered. As of 2015 the neurological correlates of synesthesia had not been established. 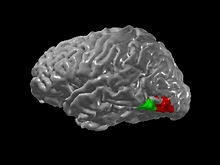 Dedicated regions of the brain are specialized for given functions. Increased cross-talk between regions specialized for different functions may account for the many types of synesthesia. For example, the additive experience of seeing color when looking at graphemes might be due to cross-activation of the grapheme-recognition area and the color area called V4 (see figure). This is supported by the fact that grapheme-color synesthetes are able to identify the color of a grapheme in their peripheral vision even when they cannot consciously identify the shape of the grapheme. A very different theoretical approach to synesthesia is that based on ideasthesia. According to this account, synesthesia is a phenomenon mediated by the extraction of the meaning of the inducing stimulus. Thus, synesthesia may be fundamentally a semantic phenomenon. Therefore, to understand neural mechanisms of synesthesia the mechanisms of semantics and the extraction of meaning need to be understood better. This is a non-trivial issue because it is not only a question of a location in the brain at which meaning is "processed" but pertains also to the question of understanding—epitomized in e.g., the Chinese room problem. Thus, the question of the neural basis of synesthesia is deeply entrenched into the general mind–body problem and the problem of the explanatory gap. Although often termed a "neurological condition," synesthesia is not listed in either the DSM-IV or the ICD since it most often does not interfere with normal daily functioning. Indeed, most synesthetes report that their experiences are neutral or even pleasant. Like perfect pitch, synesthesia is simply a difference in perceptual experience. Reaction times for answers that are congruent with a synesthete's automatic colors are shorter than those whose answers are incongruent. Synesthesia Test Variations A number of tests exist for synesthesia. Each common type has a specific test. When testing for Grapheme-color synesthesia a visual test is given. The person is shown a picture that includes black letters and numbers. A synesthete will associate the letters and numbers with a specific color. An Auditory test is another way to test for Synesthesia. A sound is turned on and one will either identity it with a taste, or envision shapes. The audio test correlates with Chromesthesia (sounds with colors). Since people question whether or not Synesthesia is just tied into memory the "Retest" is given. One is given a set of objects and is asked to assign colors, tastes, personalities, or more. After a period of time, the same objects are given back to the person and are asked again to do the same job. The synesthete is able to assign the same characteristics, because that person has already made neural associations which involves a permanent solution in the brain, rather than it just being a memory that the person had to a certain object. The simplest approach is test-retest reliability over long periods of time, using stimuli of color names, color chips, or a computer-screen color picker providing 16.7 million choices. Synesthetes consistently score around 90% on reliability of associations, even with years between tests. In contrast, non-synesthetes score just 30–40%, even with only a few weeks between tests and a warning that they would be retested. The automaticity of synesthetic experience. A synesthete might perceive the left panel like the panel on the right. Grapheme-color synesthetes, as a group, share significant preferences for the color of each letter (e.g. A tends to be red; O tends to be white or black; S tends to be yellow etc.) Nonetheless, there is a great variety in types of synesthesia, and within each type, individuals report differing triggers for their sensations and differing intensities of experiences. This variety means that defining synesthesia in an individual is difficult, and the majority of synesthetes are completely unaware that their experiences have a name. Cytowic's early cases mainly included individuals whose synesthesia was frankly projected outside the body (e.g. on a "screen" in front of one's face). Later research showed that such stark externalization occurs in a minority of synesthetes. Refining this concept, Cytowic and Eagleman differentiated between "localizers" and "non-localizers" to distinguish those synesthetes whose perceptions have a definite sense of spatial quality from those whose perceptions do not. Estimates of prevalence of synesthesia have ranged widely, from 1 in 4 to 1 in 25,000 - 100,000. However, most studies have relied on synesthetes reporting themselves, introducing self-referral bias. In what is cited as the most accurate prevalence study so far, self-referral bias was avoided by studying 500 people recruited from the communities of Edinburgh and Glasgow Universities; it showed a prevalence of 4.4%, with 9 different variations of synesthesia. This study also concluded that one common form of synesthesia—grapheme-color synesthesia (colored letters and numbers) – is found in more than one percent of the population, and this latter prevalence of graphemes-color synesthesia has since been independently verified in a sample of nearly 3,000 people in the University of Edinburgh. The most common forms of synesthesia are those that trigger colors, and the most prevalent of all is day-color. Also relatively common is grapheme-color synesthesia. We can think of "prevalence" both in terms of how common is synesthesia (or different forms of synesthesia) within the population, or how common are different forms of synesthesia within synesthetes. So within synesthetes, forms of synesthesia that trigger color also appear to be the most common forms of synesthesia with a prevalence rate of 86% within synesthetes. In another study, music-color is also prevalent at 18–41%. Some of the rarest are reported to be auditory-tactile, mirror-touch, and lexical-gustatory. There is research to suggest that the likelihood of having synesthesia is greater in people with autism. The first medical description of "colored hearing" is in an 1812 thesis by the German physician Georg Tobias Ludwig Sachs. The "father of psychophysics," Gustav Fechner, reported the first empirical survey of colored letter photisms among 73 synesthetes in 1876, followed in the 1880s by Francis Galton. Carl Jung refers to "color hearing" in his Symbols of Transformation in 1912. In the early 1920s the Bauhaus teacher and musician Gertrud Grunow researched the relationships between sound, color and movement and developed a 'twelve-tone circle of colour' which was analogous with the twelve-tone music of the Austrian composer Arnold Schönberg (1874-1951). She was a participant in at least one of the Congresses for Colour-Sound Research (German:Kongreß für Farbe-Ton-Forschung) held in Hamburg in the late 1920s and early 1930s. Research into synesthesia proceeded briskly in several countries, but due to the difficulties in measuring subjective experiences and the rise of behaviorism, which made the study of any subjective experience taboo, synesthesia faded into scientific oblivion between 1930 and 1980. Since the rise of the Internet in the 1990s, synesthetes began contacting one another and creating web sites devoted to the condition. These rapidly grew into international organizations such as the American Synesthesia Association, the UK Synaesthesia Association, the Belgian Synesthesia Association, the Canadian Synesthesia Association, the German Synesthesia Association, and the Netherlands Synesthesia Web Community. As mentioned before, one of the most notable synesthetes is Solomon Shereshevsky, a newspaper reporter turned celebrated mnemonist, who was discovered by Russian neuropsychologist, Alexander Luria, to have a rare fivefold form of synesthesia. Words and text were not only associated with highly vivid visuo-spatial imagery but also sound, taste, color, and sensation. Shereshevsky could recount endless details of many things without form, from lists of names to decades-old conversations, but he had great difficulty grasping abstract concepts. The automatic, and nearly permanent, retention of every little detail due to synesthesia greatly inhibited Shereshevsky from understanding much of what he read or heard. Ramachandran, a neuroscientist and author, studied the case of a grapheme-color synesthete who was also color blind. While he couldn't see certain colors with his eyes, he could still "see" those colors when looking at certain letters. Because he didn't have a name for those colors, he called them "Martian colors." Other notable synesthetes come particularly from artistic professions and backgrounds. Synesthetic art historically refers to multi-sensory experiments in the genres of visual music, music visualization, audiovisual art, abstract film, and intermedia. Distinct from neuroscience, the concept of synesthesia in the arts is regarded as the simultaneous perception of multiple stimuli in one gestalt experience. Neurological synesthesia has been a source of inspiration for artists, composers, poets, novelists, and digital artists. Vladimir Nabokov writes explicitly about synesthesia in several novels. Wassily Kandinsky (a synesthete) and Piet Mondrian (not a synesthete) both experimented with image-music congruence in their paintings. Alexander Scriabin composed colored music that was deliberately contrived and based on the circle of fifths, whereas Olivier Messiaen invented a new method of composition (the modes of limited transposition) specifically to render his bi-directional sound-color synesthesia. For example, the red rocks of Bryce Canyon are depicted in his symphony Des canyons aux étoiles... ("From the Canyons to the Stars"). New art movements such as literary symbolism, non-figurative art, and visual music have profited from experiments with synesthetic perception and contributed to the public awareness of synesthetic and multi-sensory ways of perceiving. Contemporary artists with synesthesia, such as Carol Steen and Marcia Smilack (a photographer who waits until she gets a synesthetic response from what she sees and then takes the picture), use their synesthesia to create their artwork. Brandy Gale, a Canadian visual artist, experiences an involuntary joining or crossing of any of her senses – hearing, vision, taste, touch, smell and movement. Gale paints from life rather than from photographs and by exploring the sensory panorama of each locale attempts to capture, select, and transmit these personal experiences. David Hockney perceives music as color, shape, and configuration and uses these perceptions when painting opera stage sets (though not while creating his other artworks). Kandinsky combined four senses: color, hearing, touch, and smell. Nabokov described his grapheme-color synesthesia at length in his autobiography, Speak, Memory, and portrayed it in some of his characters. In addition to Messiaen, whose three types of complex colors are rendered explicitly in musical chord structures that he invented, other composers who reported synesthesia include Duke Ellington, Rimsky-Korsakov, and Jean Sibelius. Michael Torke is a contemporary example of a synesthetic composer. Physicist Richard Feynman describes his colored equations in his autobiography, What Do You Care What Other People Think? Other notable synesthetes include musicians Billy Joel,:89, 91 Itzhak Perlman,:53 Alexander Frey, Ida Maria, Brian Chase and Patrick Stump; actress Stephanie Carswell (credited as Stéphanie Montreux); inventor Nikola Tesla; electronic musician Richard D. James aka Aphex Twin (who claims to be inspired by lucid dreams as well as music); and classical pianist Hélène Grimaud. Drummer Mickey Hart of The Grateful Dead wrote about his experiences with synaesthesia in his autobiography Drumming at the Edge of Magic. Pharrell Williams, of the groups The Neptunes and N.E.R.D., also experiences synesthesia and used it as the basis of the album Seeing Sounds. Singer/songwriter Marina and the Diamonds experiences music → color synesthesia and reports colored days of the week. Some artists frequently mentioned as synesthetes did not, in fact, have the neurological condition. Scriabin's 1911 Prometheus, for example, is a deliberate contrivance whose color choices are based on the circle of fifths and appear to have been taken from Madame Blavatsky. The musical score has a separate staff marked luce whose "notes" are played on a color organ. Technical reviews appear in period volumes of Scientific American. On the other hand, his older colleague Rimsky-Korsakov (who was perceived as a fairly conservative composer) was, in fact, a synesthete. French poets Arthur Rimbaud and Charles Baudelaire wrote of synesthetic experiences, but there is no evidence they were synesthetes themselves. Baudelaire's 1857 Correspondances introduced the notion that the senses can and should intermingle. Baudelaire participated in a hashish experiment by psychiatrist Jacques-Joseph Moreau and became interested in how the senses might affect each other. Rimbaud later wrote Voyelles (1871), which was perhaps more important than Correspondances in popularizing synesthesia. He later boasted "J'inventais la couleur des voyelles!" (I invented the colors of the vowels!). Daniel Tammet wrote a book on his experiences with synesthesia called Born on a Blue Day. Joanne Harris, author of Chocolat, is a synesthete who says she experiences colors as scents. Her novel Blueeyedboy features various aspects of synesthesia. Ramin Djawadi, a composer best known for his work on composing the theme songs and scores for such TV series as Game of Thrones, Westworld and for the Iron Man movie, also has synesthesia. He says he tends to "associate colors with music, or music with colors." Synesthesia as Romantic pathology: in which synesthesia is pathological but also provides an avenue to the Romantic ideal of transcending quotidian experience. Books in this category include Holly Payne’s The Sound of Blue and Anna Ferrara's The Woman Who Tried To Be Normal. Tests like this demonstrate that people do not attach sounds to visual shapes arbitrarily. Which shape would you call "Bouba" and which "Kiki"? Research on synesthesia raises questions about how the brain combines information from different sensory modalities, referred to as crossmodal perception or multisensory integration. An example of this is the bouba/kiki effect. In an experiment first designed by Wolfgang Köhler, people are asked to choose which of two shapes is named bouba and which kiki. 95% to 98% of people choose kiki for the angular shape and bouba for the rounded one. Individuals on the island of Tenerife showed a similar preference between shapes called takete and maluma. Even 2.5-year-old children (too young to read) show this effect. Recent research indicated that in the background of this effect may operate a form of ideasthesia. Researchers hope that the study of synesthesia will provide better understanding of consciousness and its neural correlates. In particular, synesthesia might be relevant to the philosophical problem of qualia, given that synesthetes experience extra qualia (e.g. colored sound). An important insight for qualia research may come from the findings that synesthesia has the properties of ideasthesia, which then suggest a crucial role of conceptualization processes in generating qualia. Synesthesia also has a number of practical applications, one of which is the use of 'intentional synesthesia' in technology. Peter Meijer developed a sensory substitution device called The vOICe (the capital letters "O," "I," and "C" in "vOICe" are intended to evoke the expression "Oh I see"). The vOICe is a privately owned research project, running without venture capital, that was first implemented using low-cost hardware in 1991. The vOICe is a visual-to-auditory sensory substitution device (SSD) preserving visual detail at high resolution (up to 25,344 pixels). The device consists of a laptop, head-mounted camera or computer camera, and headphones. The vOICe converts visual stimuli of the surroundings captured by the camera into corresponding aural representations (soundscapes) delivered to the user through headphones at a default rate of one soundscape per second. Each soundscape is a left-to-right scan, with height represented by pitch, and brightness by loudness. The vOICe compensates for the loss of vision by converting information from the lost sensory modality into stimuli in a remaining modality. ^ a b c d e [page needed] Cytowic, Richard E. (2002). Synesthesia: A Union of the Senses (2nd edition). Cambridge, Massachusetts: MIT Press. ISBN 978-0-262-03296-4. OCLC 49395033. ^ a b [page needed] Cytowic, Richard E. (2003). The Man Who Tasted Shapes. Cambridge, Massachusetts: MIT Press. ISBN 978-0-262-53255-6. OCLC 53186027. ^ a b c d e f g h i j k l m [page needed] Cytowic, Richard E; Eagleman, David M (2009). Wednesday is Indigo Blue: Discovering the Brain of Synesthesia (with an afterword by Dmitri Nabokov). Cambridge: MIT Press. ISBN 978-0-262-01279-9. ^ a b [page needed] Harrison, John E.; Simon Baron-Cohen (1996). Synaesthesia: classic and contemporary readings. Oxford: Blackwell Publishing. ISBN 978-0-631-19764-5. OCLC 59664610. ^ a b c Jewanski, Jörg; Day, Sean A.; Ward, Jamie (2009). "A Colorful Albino: The First Documented Case of Synaesthesia, by Georg Tobias Ludwig Sachs in 1812". Journal of the History of the Neurosciences: Basic and Clinical Perspectives. 18 (3): 293–303. doi:10.1080/09647040802431946. PMID 20183209. ^ a b Herman, Laura M. (2018-12-28). "Synesthesia". Encyclopaedia Britannica. Retrieved 2019-01-25. ^ Konnikova, Maria (2013-02-26). "From the words of an albino, a brilliant blend of color". Scientific American. Archived from the original on 2016-09-20. Retrieved 2019-01-25. ^ Rich AN, Mattingley JB (January 2002). "Anomalous perception in synesthesia: a cognitive neuroscience perspective". Nature Reviews Neuroscience (Review). 3 (1): 43–52. doi:10.1038/nrn702. PMID 11823804. ^ Hubbard EM, Ramachandran VS (November 2005). "Neurocognitive mechanisms of synesthesia". Neuron (Review). 48 (3): 509–20. doi:10.1016/j.neuron.2005.10.012. PMID 16269367. ^ a b c Galton F (1880). "Visualized Numerals". Nature. 21 (543): 494–5. doi:10.1038/021494e0. ^ Seron X, Pesenti M, Noël MP, Deloche G, Cornet JA (August 1992). "Images of numbers, or "When 98 is upper left and 6 sky blue"". Cognition. 44 (1–2): 159–96. doi:10.1016/0010-0277(92)90053-K. PMID 1511585. ^ "How Synesthesia Works". HowStuffWorks. 1970-01-01. Retrieved 2016-05-02. ^ a b Mroczko-Wąsowicz A.; Nikolić D. (2014). "Semantic mechanisms may be responsible for developing synesthesia". Frontiers in Human Neuroscience. 8: 509. doi:10.3389/fnhum.2014.00509. PMC 4137691. PMID 25191239. ^ a b c d e f g [page needed] van Campen, Cretien (2007). The Hidden Sense: Synesthesia in Art and Science. Cambridge, Massachusetts: MIT Press. ISBN 978-0-262-22081-1. OCLC 80179991. ^ a b Nikolić D (2009). "Is synaesthesia actually ideaesthesia? An inquiry into the nature of the phenomenon" (PDF). Proceedings of the Third International Congress on Synaesthesia, Science & Art, Granada, Spain, April 26–29. ^ Simner J (2012). "Defining synaesthesia". British Journal of Psychology (Review). 103 (6): 1–15. doi:10.1348/000712610X528305. PMID 22229768. ^ a b c d e f g [page needed] Sagiv, Noam; Robertson, Lynn C (2005). Synesthesia: perspectives from cognitive neuroscience. Oxford: Oxford University Press. ISBN 978-0-19-516623-1. OCLC 53020292. ^ [page needed] Flournoy, Théodore (2001). Des phénomènes de synopsie (Audition colorée). Adamant Media Corporation. ISBN 978-0-543-94462-7. ^ a b [full citation needed] Dittmar, A. (Ed.) (2007) Synästhesien. Roter Faden durchs Leben? Essen, Verlag Die Blaue Eule. ^ Dailey A, Martindale C, Borkum J (1997). "Creativity, synesthesia, and physiognomic perception". Creativity Research Journal. 10 (1): 1–8. doi:10.1207/s15326934crj1001_1. ^ "Investigating Spatial Sequence Synesthesia". Synesthesia Test. 2012-06-26. Retrieved 2016-05-02. ^ "Absolute Pitch and Synesthesia | The Feinstein Institute for Medical Research". The Feinstein Institute for Medical Research. Retrieved 2016-05-02. ^ Galton F (1881). "The visions of sane persons" (PDF). Fortnightly Review. 29: 729–40. Retrieved 2008-06-17. ^ Simner J, Hubbard EM (December 2006). "Variants of synesthesia interact in cognitive tasks: evidence for implicit associations and late connectivity in cross-talk theories". Neuroscience. 143 (3): 805–14. doi:10.1016/j.neuroscience.2006.08.018. PMID 16996695. ^ Edelstein Miren; Brang David; Rouw Romke; Ramachandran Vilayanur S (2013). "Misophonia: Physiological Investigations and Case Descriptions". Frontiers in Human Neuroscience. 7: 296. doi:10.3389/fnhum.2013.00296. PMC 3691507. PMID 23805089. ^ Heyes, Cecelia. "Where Do Mirror Neurons Come From?" Neuroscience and Biobehavioral Reviews (2009): 576–77. CognitiveScience. University of Oxford, 7 November 2009. Web. 30 January 2015. ^ "Derek Tastes of Ear Wax". Top Documentary Films. Retrieved 2 February 2015. ^ "BBC – Science & Nature – Horizon". bbc.co.uk. Retrieved 2 February 2015. ^ Simner, Julia (2009). "Lexical-Gustatory Synesthesia". Encyclopedia of Neuroscience. Springer Berlin Heidelberg. pp. 2149–2152. doi:10.1007/978-3-540-29678-2_2766. ISBN 978-3-540-23735-8. ^ "Types-of-Syn". DaySyn.com. Retrieved 2016-01-26. ^ Smith, Stephen D.; Katherine Fredborg, Beverley; Kornelsen, Jennifer (2017). "An examination of the default mode network in individuals with autonomous sensory meridian response (ASMR)". Social Neuroscience. 12 (4): 361–365. doi:10.1080/17470919.2016.1188851. PMID 27196787. ^ a b c d [non-primary source needed][dead link] Ramachandran VS, Hubbard EM (2001). "Synaesthesia: A window into perception, thought and language" (PDF). Journal of Consciousness Studies. 8 (12): 3–34. Archived from the original (PDF) on 27 May 2006. ^ Hupé JM, Dojat M (2015). "A critical review of the neuroimaging literature on synesthesia". Front Hum Neurosci. 9: 103. doi:10.3389/fnhum.2015.00103. PMC 4379872. PMID 25873873. ^ Grossenbacher P. G.; Lovelace C. T. (January 2001). "Mechanisms of synesthesia: cognitive and physiological constraints". Trends Cogn. Sci. 5 (1): 36–41. doi:10.1016/S1364-6613(00)01571-0. PMID 11164734. ^ Baron-Cohen, Simon; Burt, Lucy; Smith-Laittan, Fiona; Harrison, John; Bolton, Patrick (1 September 1996). "Synaesthesia: prevalence and familiality". Perception. 25 (9): 1073–1079. doi:10.1068/p251073. PMID 8983047. ^ Hubbard, Edward (June 2007). "Neurophysiology of synesthesia". Curr Psychiatry Rep. 9 (3): 193–9. doi:10.1007/s11920-007-0018-6. PMID 17521514. ^ a b Simner, Julia; Hubbard, Edward M., eds. (2013). "A brief history of synesthesia research". Oxford Handbook of Synesthesia. Oxford, UK: Oxford University Press. pp. 13–17. ISBN 978-0-19-960332-9. Retrieved 25 February 2018. ^ a b c Simner J, Mulvenna C, Sagiv N, Tsakanikos E, Witherby SA, Fraser C, Scott K, Ward J (2006). "Synaesthesia: The prevalence of atypical cross-modal experiences" (PDF). Perception. 35 (8): 1024–1033. doi:10.1068/p5469. PMID 17076063. Retrieved 26 April 2016. ^ Carmichael DA, Down MP, Shillcock RC, Eagleman DM, Simner J (2015). "Validating a standardised test battery for synesthesia: Does the Synesthesia Battery reliably detect synesthesia". Conscious Cogn. 33: 375–85. doi:10.1016/j.concog.2015.02.001. PMC 5047354. PMID 25734257. ^ Safran, Avinoam; Sanda, Nicolae (24 December 2014). "Colour synesthesia. Insight into perception, emotion, and consciousness". Current Opinion in Neurology. 28 (1): 36–44. doi:10.1097/WCO.0000000000000169. PMC 4286234. PMID 25545055. ^ [page needed] Gage, J.Colour and Culture. Practice and Meaning from Antiquity to Abstraction. (London:Thames & Hudson, 1993). ^ Goethe, Johann Wolfgang (1840). Theory of Colours. J. Murray. ^ a b Peacock, Kenneth. "Instruments to Perform Color-Music: Two Centuries of Technological Experimentation,"Leonardo 21, No. 4 (1988) 397–406. ^ [page needed] Jewanski, J. & N. Sidler (Eds.). Farbe – Licht – Musik. Synaesthesie und Farblichtmusik. Bern: Peter Lang, 2006. ^ Mahling F (1926). "Das Problem der 'audition colorée': Eine historisch-kritische Untersuchung". Archiv für die Gesamte Psychologie. 57: 165–301. ^ Campen Cretien van (1996). "De verwarring der zintuigen. Artistieke en psychologische experimenten met synesthesie". Psychologie & Maatschappij. 20 (1): 10–26. ^ Galton F (1880). "Visualized Numerals". Nature. 21 (533): 252–6. doi:10.1038/021252a0. ^ [page needed] Galton F (1883). Inquiries into Human Faculty and Its Development. Macmillan. Retrieved 2008-06-17. ^ Jung, C.G. The Transformation of Libido in "Symbols of Transformation", CW5, London 1912/1956, Routledge & Kegan Paul, para.237. ^ a b c Schacter, Daniel (1996). Searching for Memory: The Brain, The Mind, And The Past. Basic Books. p. 81. ISBN 978-0465075522. ^ "Martian Colors - Cosmic Variance". 5 November 2007. Retrieved 12 April 2018. ^ Campen C (1999). "Artistic and psychological experiments with synesthesia". Leonardo. 32 (1): 9–14. doi:10.1162/002409499552948. ^ a b c Berman G (1999). "Synesthesia and the Arts". Leonardo. 32 (1): 15–22. doi:10.1162/002409499552957. ^ [page needed] Maur, Karin von (1999). The Sound of Painting: Music in Modern Art (Pegasus Library). Munich: Prestel. ISBN 978-3-7913-2082-3. ^ [page needed] Gage, John D. (1993). Colour and culture: practice and meaning from antiquity to abstraction. London: Thames and Hudson. ISBN 978-0-500-27818-5. ^ [page needed] Gage, John D. (1999). Color and meaning: art, science, and symbolism. Berkeley: University of California Press. ISBN 978-0-520-22611-1. ^ [page needed] Campen, Cretien van (2009) Visual Music and Musical Paintings. The Quest for Synesthesia in the Arts. In: F. Bacci & D. Melcher. Making Sense of Art, making Art of Sense. Oxford: Oxford University Press. ^ Steen C (2001). "Visions Shared: A Firsthand Look into Synesthesia and Art". Leonardo. 34 (3): 203–208. doi:10.1162/002409401750286949. ^ Marcia Smilack Website Accessed 20 August 2006. ^ "Coastal Synaesthesia: Paintings and Photographs of Hawaii, Fiji and California by Brandy Gale – Gualala Arts Center exhibit: January, 2015". gualalaarts.org. Archived from the original on 2 February 2015. Retrieved 2 February 2015. ^ EG. "The Wondrous Sensory Spectrum of Brandy Gale". FORA.tv. Retrieved 2 February 2015. ^ [page needed] Nabokov, Vladimir. 1966. Speak, Memory: An Autobiography Revisited. New York: Putnam. ^ [page needed] Ellington, as quoted in George, Don. 1981. Sweet man: The real Duke Ellington. New York: G.P. Putnam's Sons. Page 226. ^ [page needed] Feynman, Richard. 1988. What Do You Care What Other People Think? New York: Norton. P. 59. ^ Cairns, Dan (24 February 2008). "Times Online interview". The Times. London. Retrieved 2008-07-24. ^ Forrest, Emma (30 March 2009). "Emma Forrest meets New York's favourite art-punk rockers Yeah Yeah Yeahs". guardian.co.uk. London: The Guardian. Retrieved 2009-05-07. ^ Chase, Brian. "Brian Chase's blog". yeahyeahyeahs.com. Archived from the original on 25 January 2009. Retrieved 2009-05-07. ^ "Synesthetes: "People of the Future"". Psychology Today. 3 March 2012. Retrieved 15 May 2014. ^ Loose Women | Marina and the Diamonds – ITV Lifestyle ITV – 27 April 2010 – Retrieved 28 April 2010. ^ [page needed] Dann, Kevin T. (1998). Bright colors falsely seen: synaesthesia and the search for transcendental knowledge. New Haven, Conn: Yale University Press. ISBN 978-0-300-06619-7. ^ This is according to an article in the Russian press, Yastrebtsev V. "On N.A.Rimsky-Korsakov's color sound- contemplation." Russkaya muzykalnaya gazeta, 1908, N 39–40, pp. 842–845 (in Russian), cited by Bulat Galeyev (1999). ^ Barth, Friedrich; Giampieri-Deutsch, Patrizia; Hans-Dieter, Klein (2012). Sensory Perception: Mind & Matter. Vienna: Springer Vienna. p. 221. ISBN 9783211997505. I invented the colours of the vowels! ^ [page needed] Tammet, Daniel (2007). Born on a Blue Day. Free Press. ISBN 978-1416535072. ^ "Chocolat author Joanne Harris talks about her latest novel Blue Eyed Boy". Metro. 7 April 2010. ^ "Meet the musical genius behind the 'Game of Thrones' soundtrack who watches each season before anyone else". Business Insider. Retrieved 2018-01-11. ^ Duffy, P.L. (2006). Images of Synesthetes and their Perceptions of Language in Fiction. 6th Annual Meeting of the American Synesthesia Association. University of South Florida. Archived from the original on 17 January 2012. ^ Duffy PL, Simner J (2010). "Synaesthesia in fiction". Cortex. 46 (2): 277–278. doi:10.1016/j.cortex.2008.11.003. PMID 19081086. ^ [non-primary source needed] Maurer D, Pathman T, Mondloch CJ (May 2006). "The shape of boubas: sound-shape correspondences in toddlers and adults". Dev Sci. 9 (3): 316–22. doi:10.1111/j.1467-7687.2006.00495.x. PMID 16669803. ^ Gómez Milán E.; Iborra O.; de Córdoba M.J.; Juárez-Ramos V.; Artacho Rodríguez; Rubio J.L. (2013). "The Kiki-Bouba effect: A case of personification and ideaesthesia". Journal of Consciousness Studies. 20 (1–2): 84–102. ^ Gray JA, Chopping S, Nunn J, et al. (2002). "Implications of synaesthesia for functionalism: Theory and experiments". Journal of Consciousness. 9 (12): 5–31. ^ Suslick, Kenneth S (December 2012). "Synesthesia in science and technology: more than making the unseen visible". Current Opinion in Chemical Biology. 16 (5–6): 557–563. doi:10.1016/j.cbpa.2012.10.030. PMC 3606019. PMID 23183411. ^ Meijer, Peter. "Augmented Reality for the Totally Blind". Retrieved 4 February 2014. ^ Striem-Amit, Ella; Guendelman, Miriam; Amedi, Amir; Serino, Andrea (16 March 2012). "'Visual' Acuity of the Congenitally Blind Using Visual-to-Auditory Sensory Substitution". PLoS ONE. 7 (3): e33136. doi:10.1371/journal.pone.0033136. PMC 3306374. PMID 22438894. ^ Carmichael, Joey. "Device Trains Blind People To 'See' By Listening". Retrieved 4 February 2014. ^ Haigh, Alastair; Brown, David J.; Meijer, Peter; Proulx, Michael J. (2013). "How well do you see what you hear? The acuity of visual-to-auditory sensory substitution". Frontiers in Psychology. 4: 330. doi:10.3389/fpsyg.2013.00330. PMC 3684791. PMID 23785345.
de Broucker T (April 2013). "Synaesthesia, an augmented sensory world: phenomenology and literature review". Rev. Neurol. (Paris) (Review) (in French). 169 (4): 328–34. doi:10.1016/j.neurol.2012.09.016. PMID 23434143. Cohen Kadosh R, Terhune DB (February 2012). "Redefining synaesthesia?". Br J Psychol (Review). 103 (1): 20–3. doi:10.1111/j.2044-8295.2010.02003.x. PMID 22229770. De Cordoba, M.J.; Riccò, D.; Day, Sean (July 2014). Synaesthesia: Theoretical, artistic and scientific foundations. Granada, Spain. p. 372. ISBN 978-84-939054-9-1. Dael N, Sierro G, Mohr C (2013). "Affect-related synesthesias: a prospective view on their existence, expression and underlying mechanisms". Front Psychol (Review). 4: 754. doi:10.3389/fpsyg.2013.00754. PMC 3798864. PMID 24151478. Fitzgibbon BM, Enticott PG, Rich AN, Giummarra MJ, Georgiou-Karistianis N, Bradshaw JL (January 2012). "Mirror-sensory synaesthesia: exploring 'shared' sensory experiences as synaesthesia". Neurosci Biobehav Rev (Review). 36 (1): 645–57. doi:10.1016/j.neubiorev.2011.09.006. PMID 21986634. Luke DP, Terhune DB (2013). "The induction of synaesthesia with chemical agents: a systematic review". Front Psychol (Review). 4: 753. doi:10.3389/fpsyg.2013.00753. PMC 3797969. PMID 24146659. Mylopoulos MI, Ro T (2013). "Synesthesia: a colorful word with a touching sound?". Front Psychol (Review). 4: 763. doi:10.3389/fpsyg.2013.00763. PMC 3804765. PMID 24155733. Price MC, Mattingley JB (May 2013). "Automaticity in sequence-space synaesthesia: a critical appraisal of the evidence". Cortex (Review). 49 (5): 1165–86. doi:10.1016/j.cortex.2012.10.013. PMID 23237480. Rothen N, Meier B, Ward J (September 2012). "Enhanced memory ability: Insights from synaesthesia". Neurosci Biobehav Rev (Review). 36 (8): 1952–63. doi:10.1016/j.neubiorev.2012.05.004. PMID 22634573. Sinke C, Halpern JH, Zedler M, Neufeld J, Emrich HM, Passie T (September 2012). "Genuine and drug-induced synesthesia: a comparison". Conscious Cogn (Review). 21 (3): 1419–34. doi:10.1016/j.concog.2012.03.009. PMID 22521474. Simner J (February 2012). "Defining synaesthesia". Br J Psychol (Review). 103 (1): 1–15. doi:10.1348/000712610X528305. PMID 22229768. Suslick KS (December 2012). "Synesthesia in science and technology: more than making the unseen visible". Curr Opin Chem Biol (Review). 16 (5–6): 557–63. doi:10.1016/j.cbpa.2012.10.030. PMC 3606019. PMID 23183411. Ward J (2013). "Synesthesia". Annu Rev Psychol (Review). 64: 49–75. doi:10.1146/annurev-psych-113011-143840. PMID 22747246. Wikimedia Commons has media related to Synesthesia. Look up synaesthesia in Wiktionary, the free dictionary. Danis, Alex. "Grapheme → colour synesthesia". Numberphile. Brady Haran. Palmer, Stephen; Schloss, Karen B. (21 August 2015). "What's the Color of Your Favorite Song? – The Crux". Discover Magazine Blogs. Kalmbach Publishing Co.
"Synesthesia". Internet Encyclopedia of Philosophy.